Tickets go on sale today for an after-show event as part of Manford’s Blackpool Comedy Festival, taking place at Winter Gardens Blackpool this May. After-show Crowd Karaoke is set to take place in the Arena, Winter Gardens, on Friday, May 10, following the Jason Manford and Friends show which is taking place in the Opera House. The event will feature a live band for the crowd to sing-a-long to, guided by big on-screen lyrics. Jason Manford said: ‘What better way is there to finish a great night of comedy, other than with a great big crowd karaoke sing-a-long? A portion of the ticket sales from the After-show Karaoke event are to be donated to two local Blackpool charities, Brian House Children’s Hospice and Streetlife. Representatives from both charities said they are delighted to be beneficiaries of Manford’s Karaoke event. The inaugural Manford’s Blackpool Comedy Festival will take place from Friday, May 10 to Sunday, May 12. Tickets for both Jason Manford and Friends on Friday, May 10 and John Bishop and Friends on Saturday, May 11 are on sale now with limited availability. 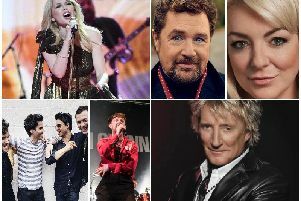 Tickets for the Crowd Karaoke go on sale at 11am today at www.wintergardensblackpool.co.uk.